Artemis the Huntress, Artemis, Diana, Diana the huntress. huntress. The Louvre Museum, Paris, 4th Century B.C. 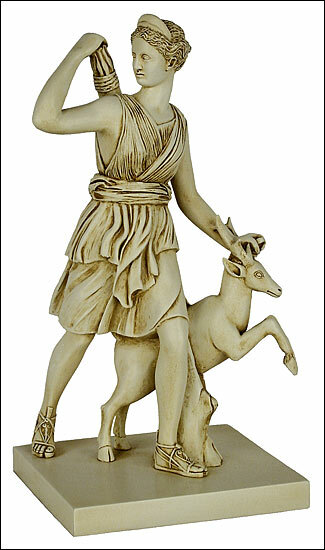 Artemis, also known by her Roman name Diana, was the Greek goddess of hunting and archery. She is often represented as a huntress with bow and quiver on her shoulder and dogs or deer at her side. The Greeks worshipped Artemis as the goddess of chastity and the guardian of youths and maidens. At the time of the difficult transition from adolescence to adulthood, the ancient Greeks used to invoke the support of Artemis and held special rites dedicated to her. Artemis was a pure virgen who had never known the joys of love and marriage. Artemis greatest joy was run through the dense forest hunting with her golden bow, accompanied by her dogs and her favorite animal, the deer. She was renowned for her skill at archery. No god or mortal could match her for accuracy. Artemis also came to be looked up as the moon goddess, just as her twin brother Apollo was viewed as the sun god. The ancient original of this reproduction was found in the villa of the Emperor Hadrian at Tivoli near Rome.